Oppositional defiance disorder (ODD) is a childhood behavioural problem characterised by constant disobedience and hostility. ODD is one of a group of behavioural disorders known collectively as disruptive behaviour disorders, which include conduct disorder (CD) and attention deficit hyperactivity disorder (ADHD). 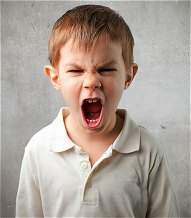 Common features of Oppositional Defiant Disorder (ODD) include excessive, often persistent anger, frequent temper tantrums or angry outbursts, as well as disregard for authority. Children and adolescents with ODD often purposely annoy others, blame others for their own mistakes, and are easily disturbed. Parents often observe more rigid and irritable behaviors than in siblings. In addition, these young people may appear resentful of others and when someone does something they don't like they prefer taking revenge more than seeking sensitive solutions. Around one in 10 children under the age of 12 years are thought to have ODD, with boys outnumbering girls by two to one. Seeks to blame others for any misfortunes and misdeeds.